GDS Mailer and GDS BPM (Branch Post Master) vacancies available in Jharkhand State Post Offices. 10th qualified and 60 days basic computer training having candidates are eligible for this Gramin Dak Sevak Jobs of Jharkhand State. Selection for Jharkhand State GDS Jobs recruitment will be based on Candidate 10th class marks only no other class and no weightage for any other courses. Online application for this GDS Jobs of Jharkhand Post Offices will be start from 20-11-2017 to 19-12-2017 though www.appost.in/gdsonline website. Complete details about Gramin Dak Sevak Jobs Recruitment 2017 details pay scale/Salary, age limits, qualification and other details are given below. 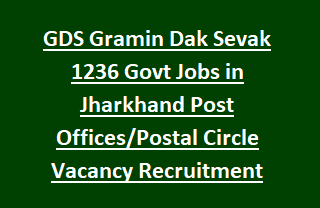 Total 1236 Jharkhand Post offices GDS vacancies available. No application fee for Women and Reserved category candidates. For Candidates belongs to GEN/OBC application fee is Rs.100. Through Registration number candidates can pay the fee in E Post offices. Matriculation or 10th class pass certificate is required and candidate should have 60 days of computer training certificate. candidate should have knowledge of Cycling. For OBC candidates upper age limit is 43 Years and for General 40 Years. For all the categories lower age limit is 18 years. Selection for Gramin Dak Sevak Jharkhand Post Offices Recruitment is based on the Marks in 10th class. If you have any higher qualifications also preference will be given based on 10th or Matriculation marks only. An automatic merit list will be generated by system after considering reservations and 10th class marks. Those candidates only receive the SMS alerts regarding certificates vertification. Online applications will be accepted through appost.in/gdsonline website. First you have to register and then pay the fee if applicable and then upload the documents of 10th class, Computer certificate, community certificate, Photo and signature images. Finally submit the application form. And take a printout out of application form which will be useful at the time of Certificates verification.